Participants warming up before the walk. 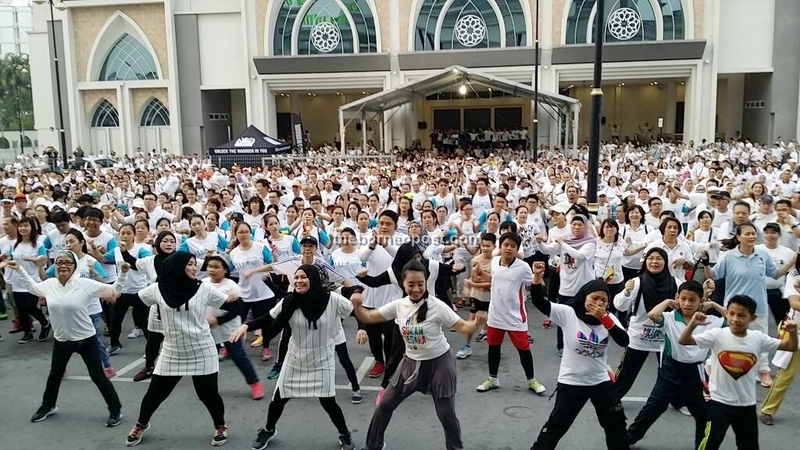 KUCHING: About 4,000 people from all faiths took part in the Harmony Walk 2017 themed “Unity is our Calling” today. Before 6.30am, most of the participants had already gathered within the vicinity of the Sarawak Islamic Complex here for a warm-up session. “Xi (inhale)… Hu (exhale)…” was repeated throughout the Taiji warm-up session that lasted about 10 minutes, followed by an aerobics session with hit music to keep the participants’ spirits up. By 7am, the national and state anthem were played for the event that was held in conjunction with Malaysia Day, which is celebrated every Sept 16. Fifteen minutes later, Islamic Information Centre chief executive officer Zabariah Matali, Archbishop of Kuching Most Rev Simon Poh and John Fozdar from the Malaysian Interfaith Network jointly flagged off the walk. The 5km walk started and ended at the complex. Participants walked along routes where different places of worships are located. The places of worships included the Sarawak Silk Temple, St. Thomas Cathedral, Tua Pek Kong Temple, Sri Srinuvasagar Kaliamman Temple and St. Joseph Cathedral.